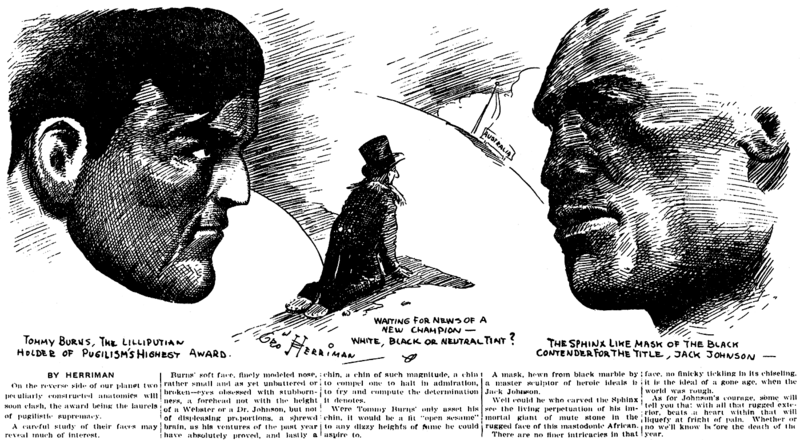 December 20 1908 -- With Jack Johnson set to defend his heavyweight championship against Tommy Burns on the 26th, Herriman favors us with portraits of both along with his thoughts on their looks. Amazingly, Johnson is described favorably, not in the typical racist venom of the day. Here's a Dwig postcard from 1909, copyrighted by R. Kaplan and marked Serie No. 55 on the reverse. This is a very fancy card with gold ink and embossing. 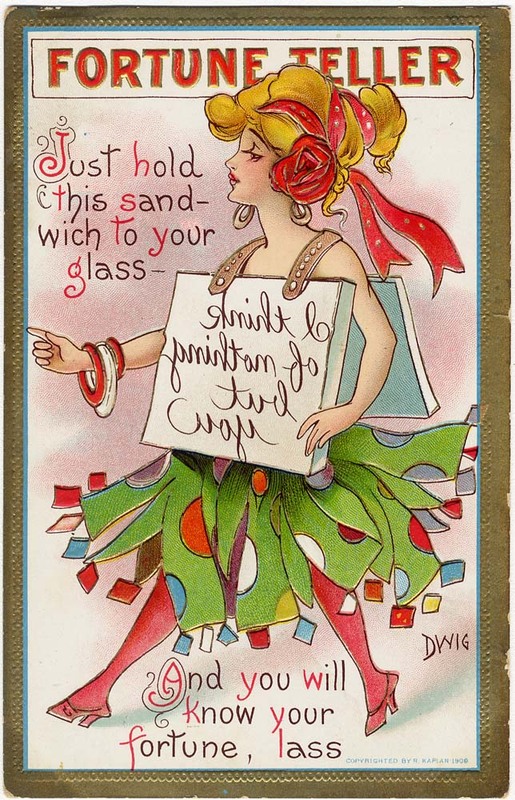 It sports a nice clever gag and a gal showing an absolutely scandalous amount of leg for 1909. Our gypsy girl is also showing acres of bare skin up top making me wonder if she has anything on behind that sandwich board. There was a whole series of Fortune Teller cards by Dwig, and they all show gypsy girls dressed awfully racy for the period. This gal I think takes the prize for most bare skin though. I find it hard to believe these were on display at the local five and dime. Maybe they weren't sold at the family-friendly five and dime, but at cigar stores or other "stag" establishments. Just a guess. And the rhyme indicates it was meant to be given to a lass! Charles William Kahles was born in Lengfurt, Germany, on January 12, 1878, according to the obituary in the Brooklyn Daily Eagle (New York), January 21, 1931. The same birth date was found on Kahles’s World War I draft card and several passenger lists. According to Robert C. Harvey, in the American National Biography: Supplement 2 (2005), Kahles, with his mother, sister, and brother, came to the United States in 1883. His father and older brother had established a business and home in Windsor Terrace, Brooklyn. Kahles was born in Germany, coming to Brooklyn when a small boy. He cannot remember when he did not have the urge for a pencil in his fingers. While attending the district school in Windsor Terrace—old Number Three—he took all the prizes in drawing. “I studied at Pratt Institute and at the Brooklyn Art School for a number of years, where I was a pupil of Joseph H. Boston. Mr. Boston is an artist of national reputation and a good friend of mine. I went to work as sketch artist for the New York Recorder at 16…. Kahles created “Clarence the Cop” for the World after Tennant was transferred to the Sunday department. Clarence ran for 10 years, being a contemporary of the Katzenjammer Kids and Happy Hooligan. The 1892 New York state census recorded the Kahles family in Flatbush, Brooklyn. Kahles was the third of four children born to Peter and Elizabeth. An 1895 Williamsport, Pennsylvania city directory listed Kahles at 321 Mulberry and his occupation as an artist for Grit. Harvey said Kahles found work at William Randolph Hearst’s New York Journal. In the 1900 U.S. Federal Census, Kahles’s widow mother was the head of the household. The family of five resided in Brooklyn at 464 13th Street; the same address in the 1910 census. Kahles’s occupation was newspaper artist. Older brother Joseph worked for a paper company, and younger brother Frederick was a silverware designer. 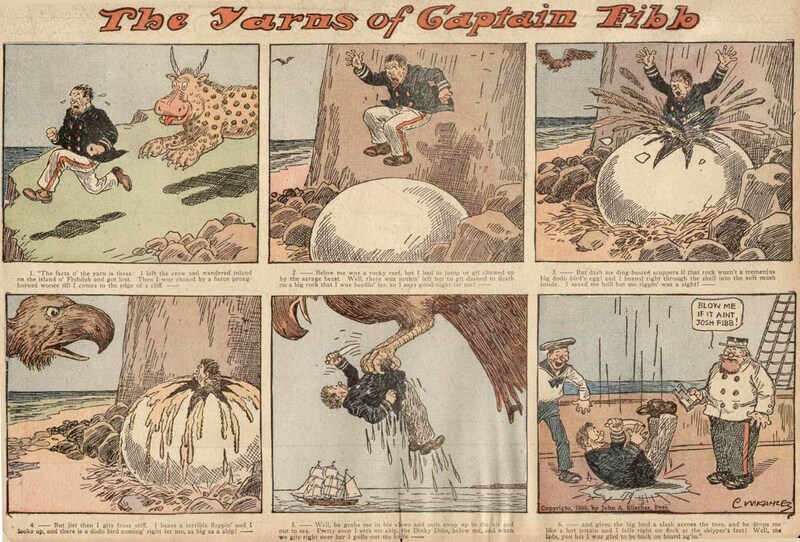 American Newspaper Comics (2012) said Kahles created over thirty comic series including Butch the Bully, Dr. Hardup, Foolish Fred, The Little Red School-House, Optimistic Oswald, The Merry Nobles Three—They Never Can Agree, Pretending Percy, and The Yarns of Captain Fibb. Hairbreadth Harry was Kahles’s best-known and longest running strip which began October 21 1906. After Kahles’s death the strip was continued by F.O. 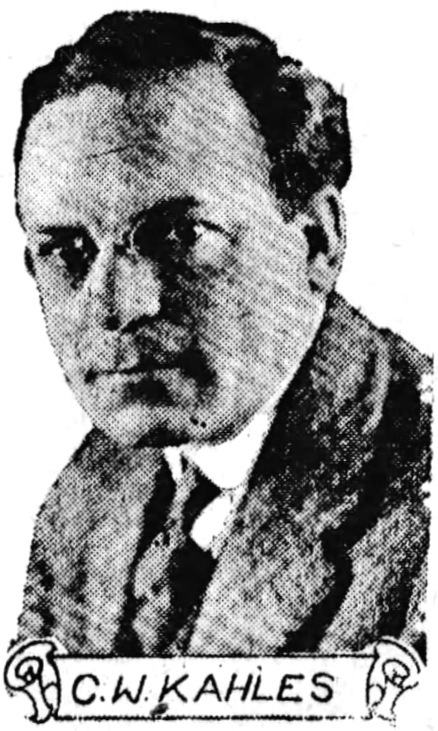 Alexander on March 30, 1931. The New York, New York, Marriage Index, at Ancestry.com, said Kahles married Julia E. Phelps on June 1910 in Manhattan. The Eagle, April 11, 1913, reported Kahles’s divorce. According to the 1915 New York state census, cartoonist Kahles lived with his mother and sister, Margaret, who was the head of the household. Their home was at 901 St. John’s Place in Brooklyn. Kahles married Helen H. Sturtevant on June 4, 1918 in Manhattan. A few months later Kahles signed his World War I draft card on September 12, 1918. He resided in Brooklyn at 1353 Union Street. He was described as medium height and build with brown eyes and hair. On September 20, 1924, the family returned from a trip to Europe, sailing from Antwerp, Belgium to New York City. The passenger list said their home address was 9312 219th Street, Queens, New York. The same address plus Queens Village was in the 1925 New York state census. The Kahles family made their second visit to Europe in 1926. A September 1929 passenger list recorded their third European trip and home address, 98 Myrtle Drive, Great Neck, Long Island, New York. Kahles’s address was unchanged in the 1930 census. Eight months later, Kahles passed away January 21, 1931, at his home in Great Neck. His death was reported that day in the Eagle. Kahles was laid to rest at Green-Wood Cemetery, lot 31394, section 468, grave 271. A note of sadness introduced itself in this connection, yesterday, when the death of Charles W. Kahles, noted artist, at Great Neck, L. I., became known. 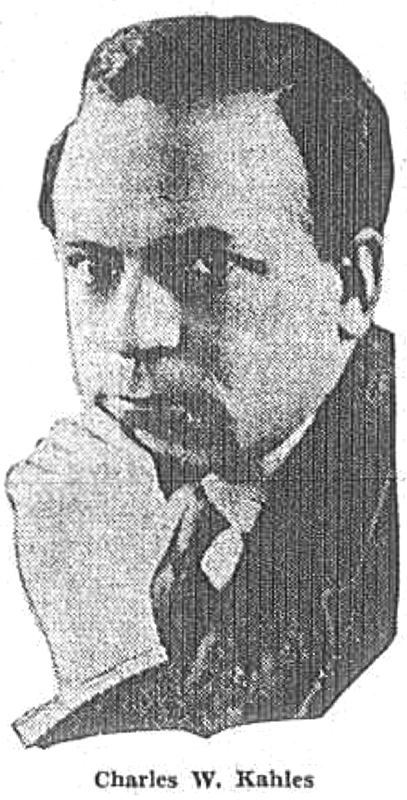 Although ill at home for nearly three weeks, he had tentatively accepted the invitation of Charles R. Macauley, the Eagle’s editorial cartoonist, to assist in the consultation game with Capablanca. As chess had long been his hobby, he was looking forward with real pleasure to the forthcoming battle of wits. His advice will be missed, for, as a member of the Brooklyn Chess Club until a year ago, he had had plenty of club experience and was a foeman to be feared. According to R. M. Varnum, secretary of the Brooklyn Chess Club, Mr. Kahles, although loath to do it, had resigned his membership last year. He found the journey between the club and his Long Island home too much of a strain. Some 15 years ago, it is recalled by members, he suffered from heart trouble, from which by the exercise of care, he recovered. On the walls of he Brooklyn Chess Club are several of Mr. Kahles’s comic cartoons dealing with chess. When at the board he, as a good player, took his chess seriously, but, naturally, he was only too well aware of its humorous side. The terms of Kahles’s will was published in the Eagle, February 6, 1931. Cole and I knew Kahles's daughter Jessie. She was a tireless advocate for her father's legacy. She was also humorless, impatient and probably made more enemies than friends over the years. Nevertheless, we tried our best to get people to care about him, and not that he was unworthy of interest. Hairbreadth Harry was truly a watershed strip, and Kahles's other early strips with Sci-Fi themes are important too. But alas, everything he ever did was for syndicates that shriveled up too long ago for them to do any work promoting them into an anywhere modern era. Anyway, she gave us a ton of his books and family papers/ photos, some artwork, including an original of Clarence the Cop, and the Trade Mark to Hairbreadth Harry. It expired a long time ago, nobody knew who it was. Anyway, we had a gallery show of Harry and a banquet for her in Philly in 1987, among the guests being F.O. Alexander, who succeeded Kahles on the feature. Kahles (pronounced Kaw-Less) was apparently a very unhappy man, Jessie said his wife never had anything but contempt for him, and he holed up in his studio for days at a time, listening to his Classical records and devoting himself completely to Harry and co. hour after hour. He was also a slight, perhaps sickly man. I have a professional portrait photo of him at his drawing board (drawing the 1 December 1929 Sunday) and he looks gaunt and tired. 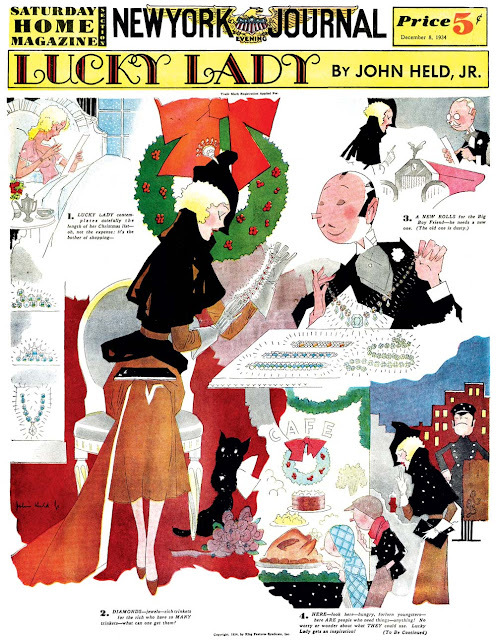 In 1931 it wasn't iunusual to die at 53, the national average for a man was 59.
the Hairbreadth Harry daily sequence reprinted in nemo magazine from Mark Johnson's collection has long been a favorite and highlight from that great anthology. the Spencer Research Library at the University of Kansas in Lawrence had a few CW Kahles materials (family letters mostly), but maybe no comics (?) or at least disappointingly few. The story you reference, which we gave a title to, through time and space", was a good representative of Kahles's writing abilities. He was a real wit and satirist, certainly one of the most literate cartoonists of his time. I believe he was really a genius. I own the only original art from that story, an April 1924 strip featuring Rudolph only. Hairbreadth Harry is a strip that is worthy of a reprint collection, but nobody would take a chance on such a forgotten title, regardless of quality. King Features Syndicate's magazine covers for 1934 might have been subtitled "The Held and Barclay Show", since the syndicate managed to give those two artists practically every cover for the whole year. McClelland Barclay's series, Glamorous Girls, consisted of highly sophisticated glamor pusses, which made for quite the counterpoint to the other series, John Held Jr.'s Lucky Lady. Held, of course, went for his stable type, the skinny and coltish little minx whose clothes form only the very slightest veneer for her body. Anything but glamorous, Held's girls exude a naive sexuality that contrasts sharply with Barclay's sophisticated and highly coiffed cover girls. The series came to no particular conclusion, but the plot was so gossamer-thin that there may or may not have been additional installments planned. Thanks to Cole Johnson for the sample scan (note that the New York Journal ran the King magazine covers on the Saturday after the official Sunday release dates). Victor John Green was born in Houston, Texas, on August 27, 1915, according to the birth certificate available at Ancestry.com. The 1920 U.S. Federal Census recorded Green as the oldest of two children born to John and Carrie. His father was a restaurant operator. The family resided in Houston at 2106 Noble. Their address remained the same in the 1930 and 1940 censuses. Green and his address were listed in the 1932 Houston city directory. A 1935 directory included Green’s occupation as clerk at Cottrill & Eidson, an insurance company. 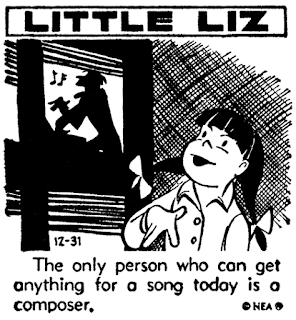 In the 1940 census, Green was a self-employed commercial artist. He, his wife, Bessie, and son, John, lived with his parents. The 1940 directory said Green was an artist. He was a commercial artist in the 1942 directory listings. A World War II military record for Green has not been found. 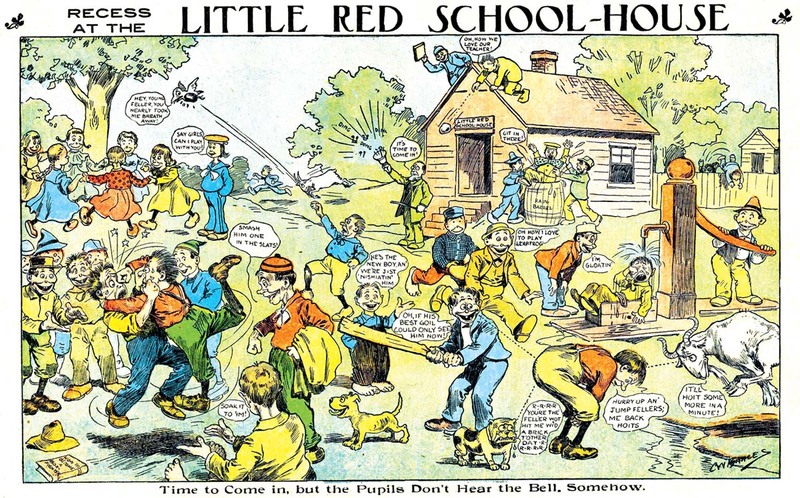 During the war, Green produced a humor magazine, Left-Overs, to be purchased and mailed to soldiers. …the artist, is a six-footer from Houston, Tex., who hesitated a long time between art and professional boxing. Art won around about the time Green married, even though for a time art meant such jobs as illustrating for a uniform company’s catalog during the war, at the printshop where he was a partner. 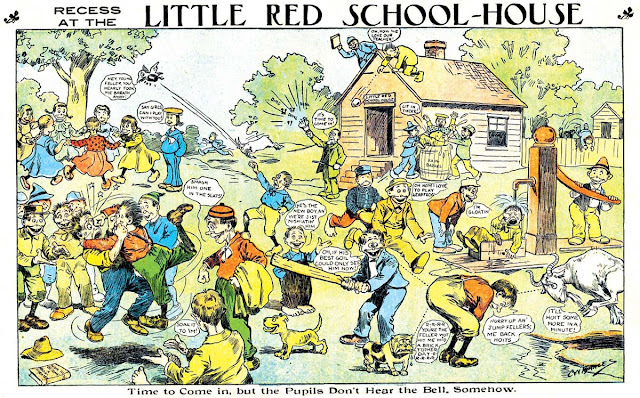 He devoted spare time creating a series of four “GI Cartoonbooks” which began as a project for hometown boys and developed a wide demand. 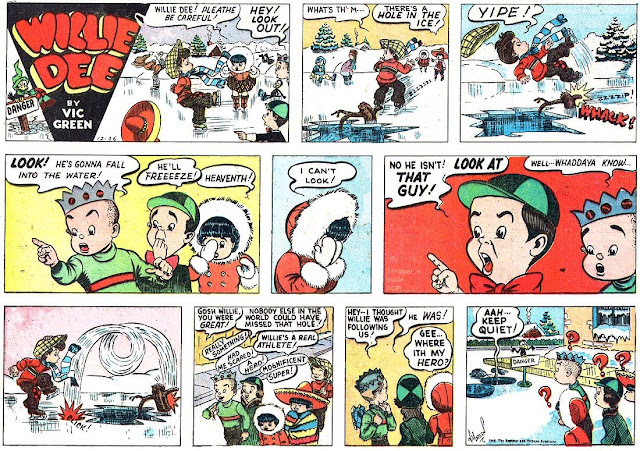 American Newspaper Comics (2012) said Green produced Willie Dee dailies and Sundays from May 10, 1948 to November 15, 1952, for the Register and Tribune Syndicate. 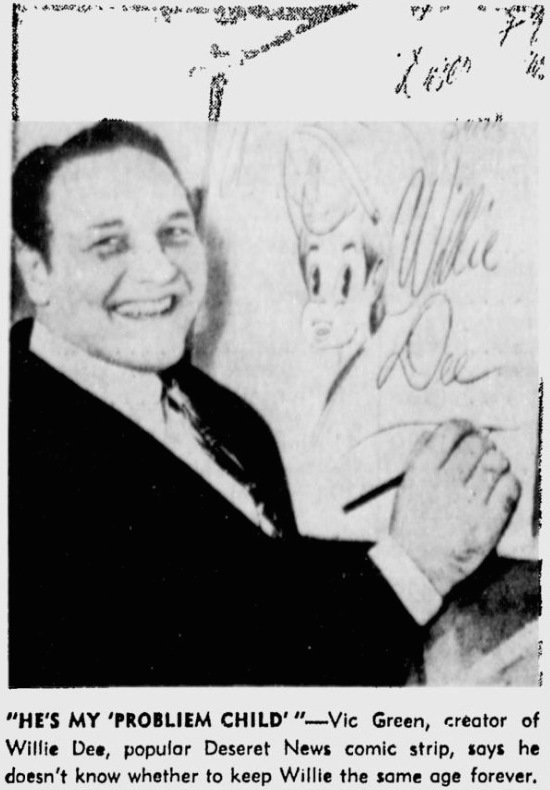 Willie Dee appeared in the Deseret News (Salt Lake City, Utah) which wrote about Green and his creation on March 15, 1949. N.P. Nichols commented about her uncle. Victor J. Green was my uncle, my mother, Nicholina T. Green Nichols', only brother. According to what I remember my mother saying about the Willie Dee strip, Uncle Vic just got tired of doing it and quit. He worked for Premier Printing in Houston, Texas for many years and lived here with his wife and children all of his life until his death in 1989. 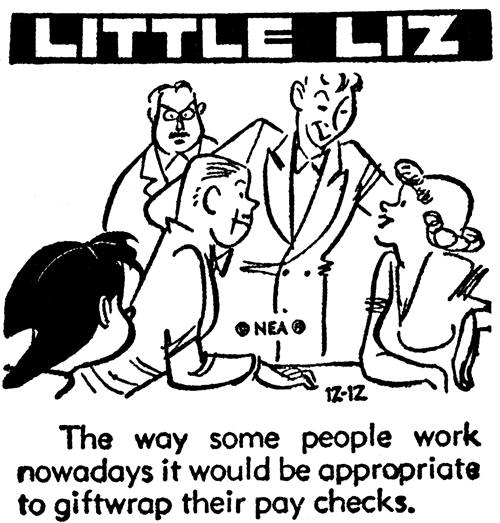 I remember seeing a copy of the GI cartoon book around here somewhere it was kind of racy as I recall. He was an accomplished painter as was his father, a cartoonist and photographer. He also designed giant Texas dollars which were sold as souvineers [sic] years ago, that had hidden sayings and pictures on them I believe they were printed by Premier. A family tree at Ancestry.com said Green had four children. Green passed away April 3, 1989, in Houston, according to the Texas death index at Ancestry.com. He was laid to rest at Forest Park Cemetery. It is hard to understand the thinking that went on at NEA, the syndicate that offered newspapers a giant package of material for one low price. How did they decide when and if they should add a particular new feature? 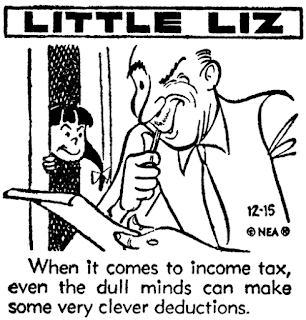 Little Liz is a good example of the sort of feature that makes me scratch my head. 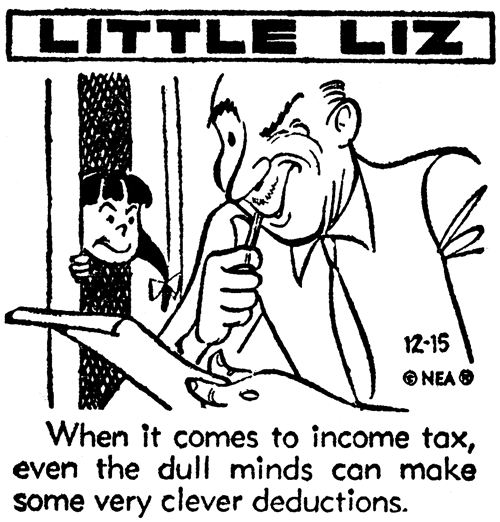 It was a tiny 1-column cartoon that was obviously meant only as a hole-filler. 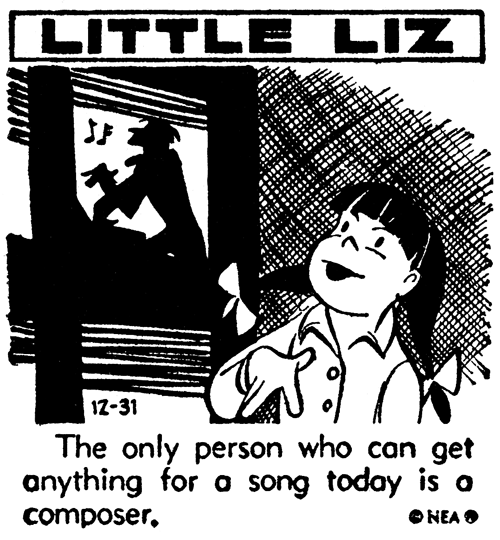 There was certainly no desire or hope to rock the world with Little Liz, as the syndicate barely promoted it, and the creators were not given any credit. So what possessed them to put it in the package? Surely if clients were begging for hole fillers, NEA offered many other options. So why Little Liz? Well, I guess a perfectly valid answer is "Why not?". 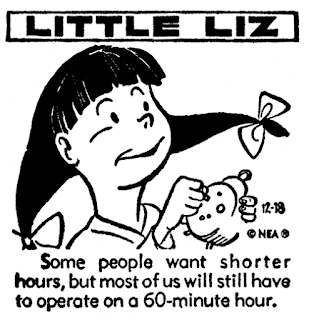 The itty-bitty 1-column feature Little Liz ran from October 22 1951 until some undetermined date in 1965. The art was by NEA bullpenner Walt Scott, and the writing was by Marjorie Johnson, who in the sole promo I've seen, was billed as "well-known in the west for her sharp-edged wit." 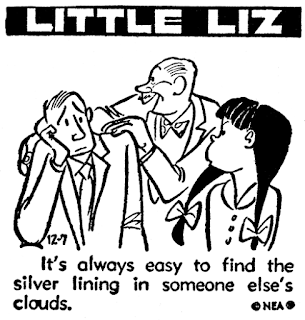 Originally Liz was probably supposed to be a discernable character, but Mrs. Johnson had a penchant for writing whatever came into her head, whether or not it made any sense to be coming out of a little girl's mouth. Her sayings were quite pithy and playful, often wise, and sometimes downright snarky. Occasionally they were even memorable. She is often cited in quotation books for a particular Little Liz saying -- "A race horse is the only animal that can take several thousand people for a ride." In 1965 the panel was upgraded from its traditional tiny one-column size to a regular full-size two-column panel. This apparently didn't interest NEA's client papers, and finding examples in this format is like looking for needles in a haystack. The change apparently was a last-ditch effort for some reason, and Little Liz was cancelled that year.